California resident Monica Emerson has filed a class action lawsuit against Apple this week, accusing the company of releasing iOS updates which were "specifically designed and programmed to reject, starting on November of 2016, old iPhone chargers from properly charging the iPhones." The complaint, obtained by MacRumors, alleges that Emerson bought an iPhone 7 in September 2016 and charged the device with Apple's power adapter included in the box without issue until around October 2017, when it stopped working alongside the alert "this accessory may not be supported." In or around October 2017, Plaintiff attempted to use her Apple Charger and received a message that read "This accessory may not be supported." Thus, requiring that people buy a new charger for her iPhone. Upon learning this, Plaintiff felt ripped off, cheated, and violated by Defendant. 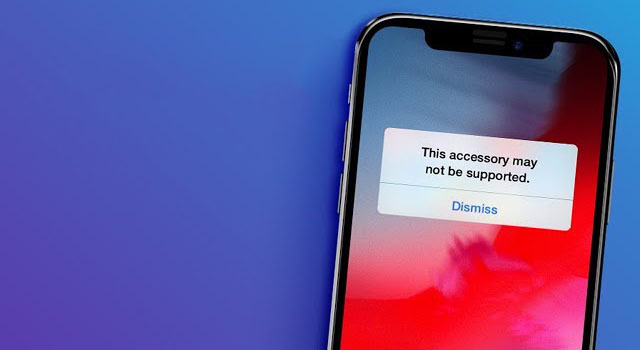 The alert is part of Apple's system that aims to protect iOS devices against potentially dangerous aftermarket accessories. Emerson believes the alert forced her and thousands of other customers in her situation to buy new chargers, with total claims exceeding $5 million. As a result, she is suing Apple for damages, accusing the company of false advertising, unfair business practices, fraud, and other violations of California laws. Emerson supposedly always used Apple's first-party charger, but it's unclear whether it was connected to the iPhone with an Apple-certified Lightning to USB cable under the Made for iPhone program. If she was using an Apple power adapter with an uncertified cable, then the message was correctly displayed. While it's hard to believe that Apple released an iOS update that prevented its own chargers from working—it simply doesn't make sense—there have been scattered complaints of the "this accessory may not be supported" system throwing false positives for Apple-certified chargers and cables over the years. False positives can occur for a variety of reasons, including something as simple as a dirty pin on the Lightning connector. Emerson is seeking a jury trial in the U.S. District Court for Central California. So instead of going to the Genius Bar or calling customer service to have it replaced for free, let’s file a lawsuit. No company can win in our litigious society. You fail to protect people and you're sued. You proactively protect people and you're sued. I find i t amazing that she might get anyone to join such and obviously frivolous lawsuit... The warning is largely to protect you from using chargers that may burn your house down.. It would be great if people who are found to have brought frivolous lawsuits were forced to pay the legal costs of those they sue regardless of any countersuit from the other party. A lien on their taxes/home or a reduction in their benefits would put a quick stop to a lot of these get-rich-quick schemes. It’s the cable lady. It’s alwsts the cable. If your cable is damaged OR your lightning port is clogged with lint, this will happen. The iPhone 7 will charge with ANY USB power source capable of delivering power to it. Apple charger, third party, computer (Mac or pc), powered usb hub, chargers built into power strips, built into wall outlets, airplane seats, cars. I’ve used them all with my 7. It just requires a good cable. No iOS update for the iPhone 7 has disabled any chargers, not even a dot release via temporary bug. But a bad cable won’t send the right confirmation to the iPhone. Thank goodness! I was really struggling for those few hours since somebody filed a class action lawsuit! They'll "think different" when their cheap $5 gas station charger starts a fire in their house. This is some class action BS. The warning is to help save people from all the dangerous knockoff chargers and cables on Amazon and elsewhere that have caught people on fire or electrocuted/shocked them or fried their phones. She, like many other people probably bought one of these $1 cables and is too dumb to know the difference.